The Lías Finas Clarete is a pink/rosé/clarete produced with a blend of white Viura and red Garnacha grapes. As the name points out, it was aged in contact with the lees in 500-liter French oak barrels for some 16 months. It has a salmon color and, as with the whites, it's presented in a clear bottle that lets you admire the pale salmon tones. You anticipate a subtle rosé, but this is not your average rosé. Like its siblings, it has a strong personality and the aromas are unusual, with a mixture of iron, blood and dried leaves that surprised me. 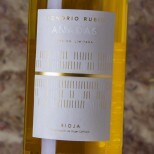 The palate has the freshness of a white, and like the rest of the wines, the oak is unnoticeable. An intriguing rosé that might develop further nuances in bottle. I'd like to see this again in a couple of years. 1,232 bottles produced. Crianza de 16 meses en barricas usadas de roble francés de 225 litros.